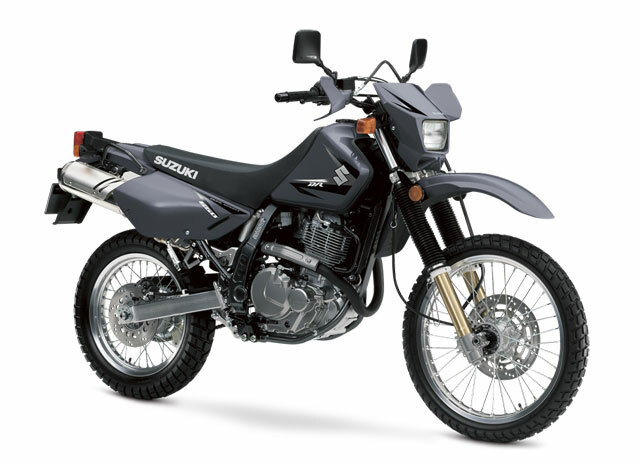 The Suzuki DR650SE is really a Dual Sport, not an Adventure Bike. With no windscreen, riders become worn out from the wind on the highway and the small gas tank requires filling up after just 150 miles. the DR650SE has no luggage rack, so there is no place to strap gear for a multi-day ride. However, with a few aftermarket modifications the DR650SE can be made into a capable Adventure Bike. Unlike many performance oriented Dual Sports, the DR650SE has a mildly tuned air-cooled engine that makes it reliable for racking up the miles. In fact, it has a reputation for being bulletproof and easy to work on, just like the Kawasaki KLR650. Where the DR650SE excels is in the dirt. The DR650SE includes a 21-inch front wheel and 17-inch rear, a supple long-travel suspension and wire spoked rims. It has true dirt bike riding ergonomics and feels low and stable off-road. Smooth torque and a lower seat height make it an excellent bike for learning how to ride off-road. The bike is capable of tackling the most difficult trails, but the soft suspension can start to bottom out at higher speeds. Even with aftermarket upgrades, the DR650SE is still not a great bike for the highway. Lack of power will make aggressive passing maneuvers difficult and the bike has a twitchy feel at higher speeds. Vibration is noticeable, but not as bad as the KTM 640 Adventure. Overall, this is a great option for new adventure riders that will spend a lot of time riding off-road. The DR650SE has a low-cost of entry and is inexpensive to maintain. With a relatively low seat height (the low shock setting drops the seat height down even lower) and light weight, the bike is confidence inspiring for smaller riders off-road. A large number of aftermarket accessories are available for this bike, allowing you to customize it to your Adventure Riding needs. Just add an aftermarket windscreen, large tank, and luggage rack to make this a true Adventure Bike.